All trip long we anticipated being able to catch Niagara Falls on the way back to Toronto. We felt fortunate to have a whole day to explore the region. We started on the American side which doesn’t see the rainbow falls straight on, but is none the less impressive with the rapids, American falls and top of the falls lookouts. Then it was back to Canada and the thousands of tourists viewing the full view and grandeur of this natural marvel. 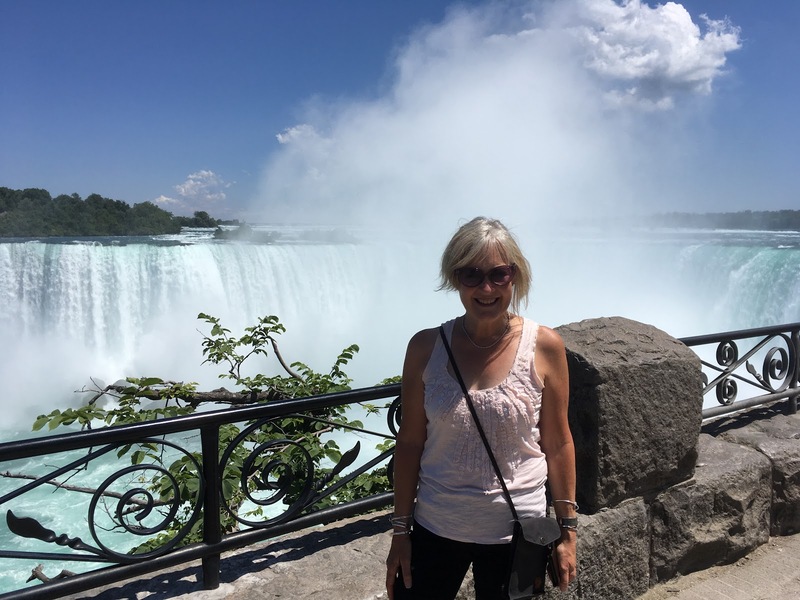 We walked along the promenade snapping pictures and enjoying the cool of the falls on a hot day. We had read about the town of Niagara-on-the-lake some 20 miles north on the shores of Lake Ontario. It is big time wine country and the town is high end tourism with wine tasting and galleries and streets lined with amazing flowers and landscaping. We ate an early dinner at a sidewalk restaurant and had lasagna which seemed a good change from all the seafood of the last week. We had just enough time to drive into Toronto before dark and find our motel. We enjoyed the clean motel and a short walk through a residential area before spending our last night on vacation. We got up early and got the rental car back by 8 and caught the train for the airport and the long trip on three airplanes home. 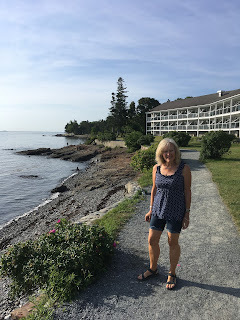 Not wanting to leave Bar Harbor for the long trip west, we got up early and went into town for a morning walk along the waterfront enjoying the flowers, coastline and luxurious hotels. Next, we drove through Acadia National Park, taking in a few sights. The long haul from northern Maine to Rochester, New York was accompanied by reading chapters of Anne of Green Gables to each other. The northeast United States likes its toll roads. We chose Rochester for its proximity to the following day’s adventure and checked into a rather crummy, ‘Quality Inn’. We stumbled across an excellent river walk by the University of Rochester. It had been 20 years since we had seen fire flies and we enjoyed the warm evening walk after the 12 hours of driving. We ate at an Applebee’s for a late dinner. The breakfast was exceptional with the proprietor taking pride in his work. The breakfast room overlooked the bay. We faced a long day on the road, so we enjoyed a great start. 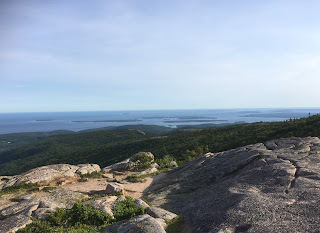 We drove out of Nova Scotia, through New Brunswick and into Maine, making it to Bar Harbor in time to drive up Cadillac Mountain in Acadia Park. The views were great in the clear evening but it was cold and very windy. 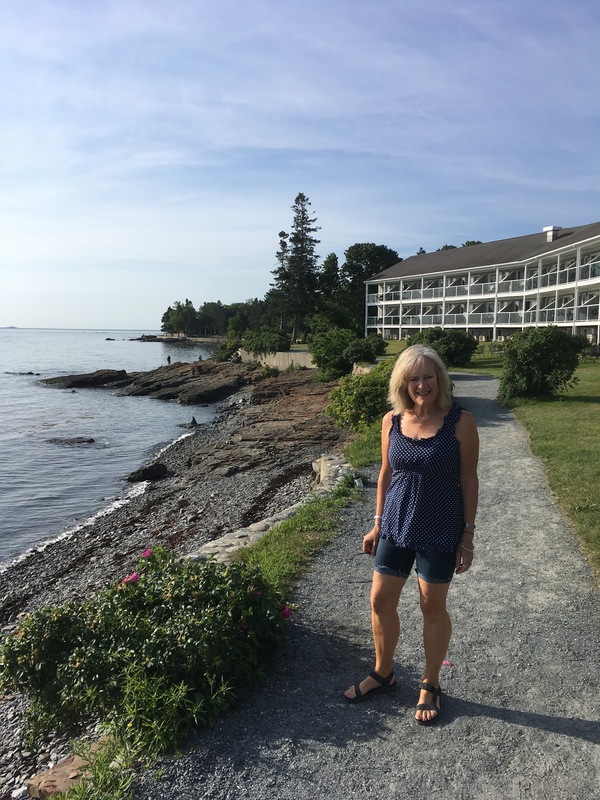 We ended the day shopping and eating in Bar Harbor which is quite the East Coast destination with tour buses and cruise ships. I finally convinced Esther to have some wood fire pizza. We enjoyed a wonderful beet salad and pizza on the patio in the balmy darkness. We ended the day with a waterfront walk in the dark. Our hotel was a nicely remodeled roadside motel not far from Bar Harbor. 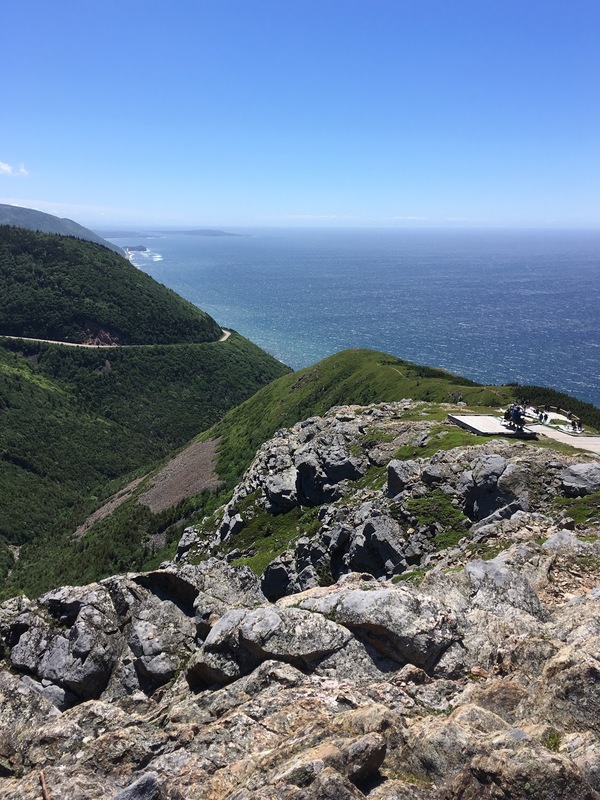 After some debate, we had decided to make the long trek up to the top of Nova Scotia and see the famed Cape Breton Highlands. We also wanted to check out the Acadian town of Cheticamp. The drive up the west coast was scenic with cute coastal towns. The National Park reminded us of California’s Big Sur coast. The highlight of the park was the 4 and a half mile hike Skyline Ridge trail. 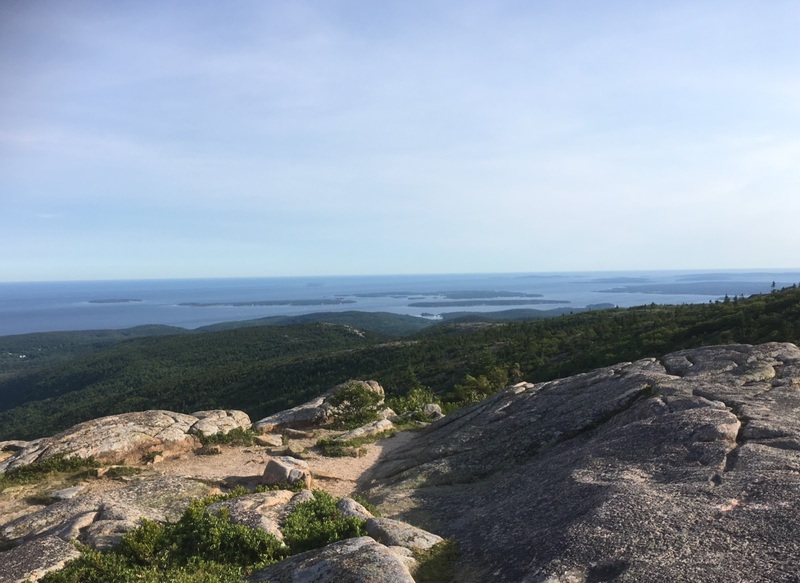 After hiking through what felt like an alpine forest of short trees and bright ferns, the trail opened onto a granite boulder ridge that looked over the sea and surrounding coastline. We saw a moose grazing 10 yards from the trail, seeming not to notice the gawking people. 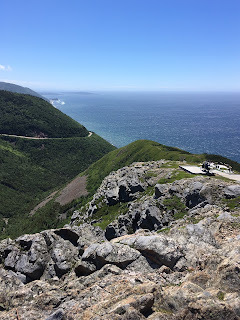 The long drive over the top of the cape brought us to a recommended 3 mile hike to a headlands on the Atlantic side of the island. It was a very rewarding hike with lots of good views. Our hotel for the night was a long drive back down to Port Hawkesbury and a bed and breakfast. Our dinner that night was at a local pub, haddock and chips and spicy hamburger. The room was a little cramped and the bed squeaky. 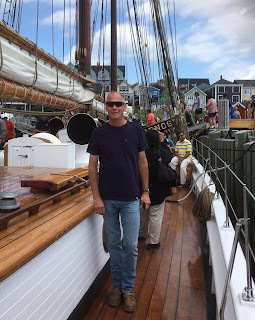 The forecast was for rain in the afternoon, so we quickly drove down the coast to Lunenburg. This part of the coast is marked by endless inlets and quaint villages. The crown is the town of Lunenburg with its Victorian buildings on the waterfront and the famous Bluenose II sailing vessel. The boat is the pride of the town if not the whole province. We were able to walk her decks while she was at the dock between sailings. I bought a souvenir shirt and Esther a bag. After some wonderful haddock chowder we drove back to Halifax, hoping the rain would hold off for a waterfront walk. We went to the Maritime Museum and viewed the Titanic exhibit as well as an IMAX movie about Bluenose and enjoying some great boats. By the time we were done, it was pouring outside and we decided to head out of town and head north. Our ‘motel’ for the night was a university dorm room. Being an agricultural school, there was a pervasive smell to the campus and dorm. Esther wasn’t too thrilled with the coed restroom and showers. The surprise of the night was a great meal at a Thai restaurant that ended up being free because they messed up the order and I sat and watched Esther eat her whole meal before they finally brought mine. We used the dorm laundry, but a mysterious fellow patron found it necessary to move our clothes. Before our long road trip to Halifax, we stopped at the village of Victoria by the sea. We walked through the small village in the cool of the morning. 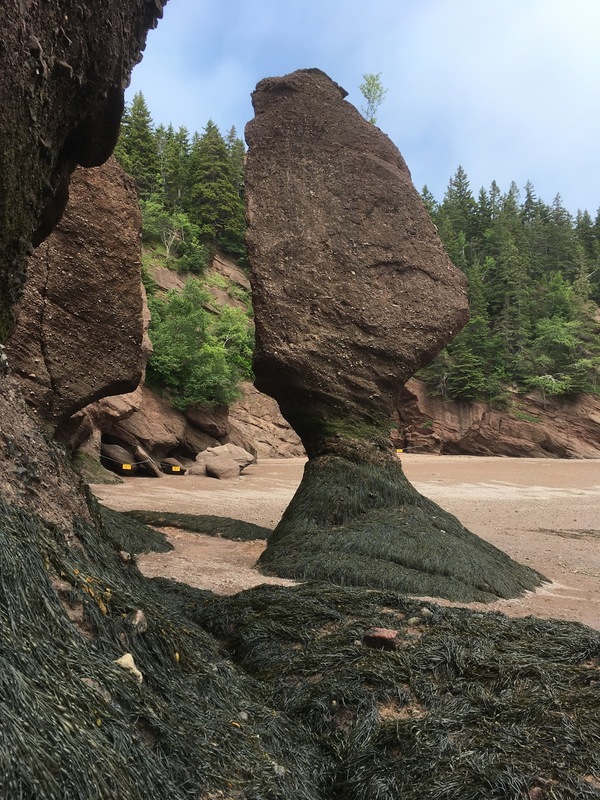 The Nova Scotia landscape was no relief from the spindly forests and deserted landscape of NB. Our hotel in Halifax was uninviting with a tacky renovation and remnants of a dumpy trumpy. 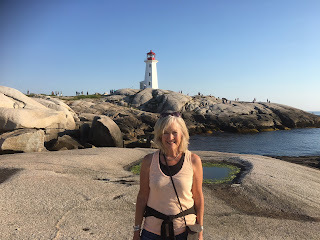 We quickly exited the premises and headed for Peggy’s Cove since the next day looked like rain. Peggy’s Cove was amazing. We couldn’t get enough of the smooth granite rock, classic lobster fishing village and lighthouse. The weather was unusually warm, and we ate at the reasonably priced restaurant and caught the sunset. 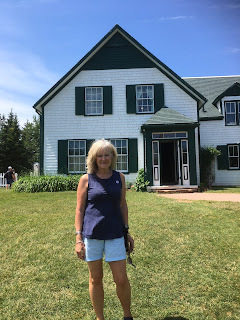 After another good breakfast at the motel, we headed for Prince Edward Island (PEI). Our initial impressions were very pleasant. We reveled in the open crop fields and ocean inlets with quaint villages scattered through the countryside. It was a welcomed change from the monotonous spindly forests of New Brunswick. We followed the central coastal route to Cavendish and the House of Green Gables. We had been anticipating the sight after reading the book to each other as we drove. The site did not disappoint us and we toured the house and walked the ‘haunted forest’ and ‘lovers lane’. Next we drove to Charlottetown and found our Victorian Prince Street Hotel which was a little cramped, but pleasant enough. After a quick walk through the city center we got in the car and headed for the Eastern Shore. Farms gave way to forests and we were struck by the remoteness of the area. We did find a nice place to eat in the coastal village of Georgetown. Esther loved her lobster melt on crusty bread and I enjoyed halibut and fries. 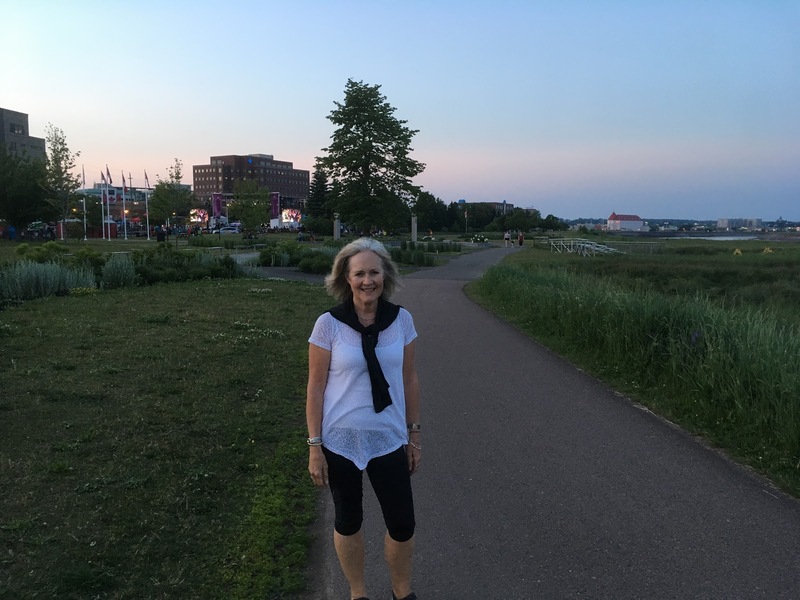 We ended the evening with a drive back to Charlottetown and an evening walk on the waterfront walkway. The Amsterdam Inn breakfasts were definitely the best complimentary meals of the trip. We decided to stay two nights and take in a few nearby sights. In the morning we drove out to Hopewell Rocks and the ‘ocean floor’ walk in the Bay of Fundy. The weather was marginal, but the rain held off. We joined the hundreds of other tourists wandering among the sea stacks and snapping photos. Lunch was chips and an apple on the road as we crisscrossed Moncton and drove up to Shediac to witness the famed ‘warmest Atlantic water north of Virginia’. We parked on a pier and then walked several miles kicking the warn Northumberland Strait water. Our late sunset dinner was a real delight - lobster seafood platter - the half lobster was complimented by an assortment of other items. We returned to Moncton to enjoy a second night in our motel. This was definitely a travel day, the cost of a road trip. A couple of hours were spent driving through pastoral Quebec, with its dairy farms and wooded marshes. When we got to New Brunswick, we were struck by its remote feel - endless rolling hills of forests filled with stub trees and very little sign of people. The long drive was redeemed by reading Anne of Green Gables to each other. We drove until 7 and checked into the Amsterdam Inn in Moncton and then ate at a Chinese Buffet and enjoyed an evening walk along the riverfront, complete with an outdoor symphony. We had a pleasant morning drive through the Quebec countryside to Quebec City. We checked in early to the motel and drove to the old city. The old city is surrounded by a wall with four entrances. 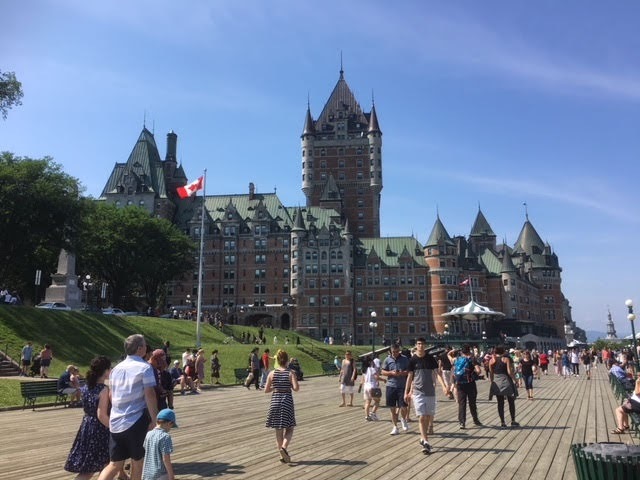 We walked on the top of the wall up to the citadel and then the elevated boardwalk along the cliff that overlooks the river and ends up at the impressive Château. We descended the long stairs down to the oldest part of the city strolling the narrow street and finally enjoying some poutines at a restaurant overlooking the street. We walked around the city another lap, admiring the buildings and street decor, buying a silver necklace and then eating at a restaurant that served local Quebec dishes. We had shepherds pie and had an unexpected conversation with a couple from Denmark at the next table. The restroom was a one of a kind with plywood stalls and a claw foot tub for hand washing. We retired from the day with a drive to the outskirts of the city and our waiting motel room. A morning walk back downtown to see the Ottawa cathedral and enjoy some beaver tail and good coffee got our day off to a good start. We had a pleasant drive through the Quebec countryside above the Ottawa River. We noticed an immediate change as all signage was in French with no English. We dropped back over to the Ontario side of the river for gas and then a great tourist info spot for our trip into Montreal. It was a good thing as Montreal is totally French. We thought it would be more of a gradual transition to Quebec, but no it is FRENCH. We noticed right away the lack of Canadian flags, only Quebec flags. We were warned that Quebec has an attitude on Canada Day. 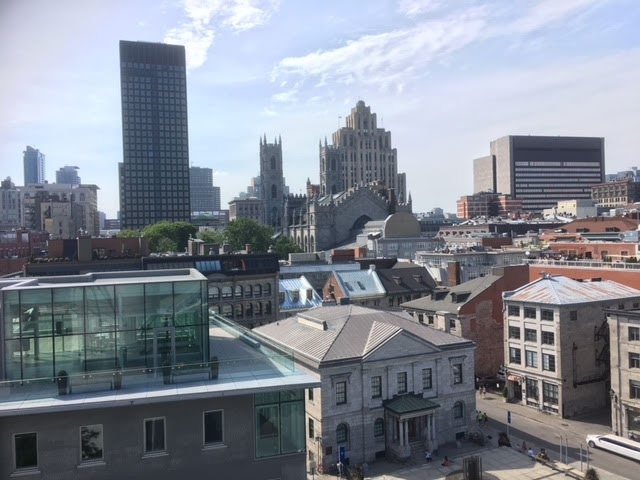 We followed the very excellent directions to Old Montreal and enjoyed a hot but shaded six and a half mile walk around the cobblestone streets, bustling French tourists and historical buildings. The cathedral was the highlight; however, we didn’t go in because of the very long line. We ate dinners of salmon and steak before another stroll around Old Town and the waterfront and calling it a day. We drove an hour out of town to Drummondville for a very pleasant motel with good air conditioning. Our Pacific time zone brain clock had a tight grip on us and we slept long past our alarm. A goose chase for a paper map and breakfast gave us a late morning start, fighting Toronto traffic in the heat. The main highway to Ottawa was closed and the alternate route was a two lane highway with stop lights. The result was an 8 hour trip that should have taken four. 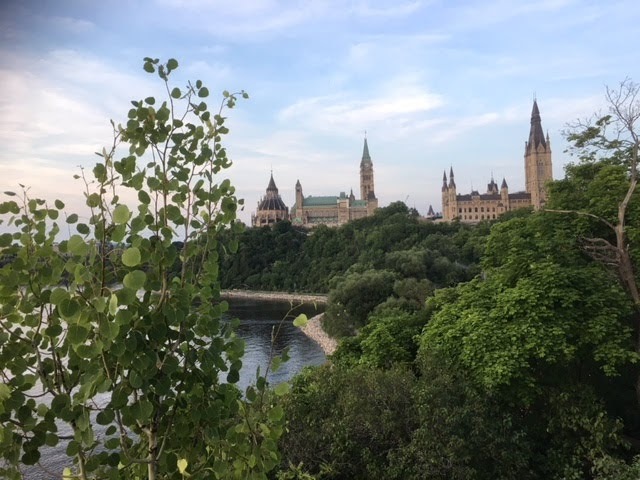 Our touring day started late in Ottawa. The Econolodge motel was close to downtown but left a lot to be desired (stinky and a little dirty) We went straight to Parliament hill which was abuzz with preparations for Canada Day with music stages and service tents. It certainly took away from the aesthetics, but added a measure of anticipation. We did enjoy the views of the river, canal and buildings in the glow of the evening light. 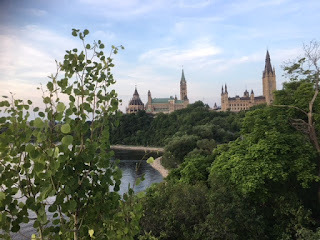 We managed a six and a half mile walk through government grounds and the touristy downtown core before we needed to close our day with fish and chips at an Scottish pub amid the bustling night life of a summer evening. Our red eye special from Vancouver to Toronto proved to be just that. Neither of us could discover a comfortable position and we were lucky if we caught a fitful hour of sleep. 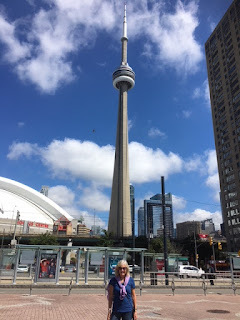 Our day started early in Toronto with a pleasurable train ride into the city through a dreary foggy morning. We elbowed our way with commuters through Union Station and found our rental car counter in the center of an of office complex. The service was great and they let us leave the car in the parking garage for the day as we explored the city. We ended up taking a nine mile walk along the waterfront and through the city. As we walked the sky cleared. We ate lunch at the historic St. Lawrence Market. (Korean/Japanese) By mid-afternoon we were exhausted and found our hotel. (Don Valley ‘Urban Resort’) We crashed for an hour and then took a walk in the neighborhood. We ate some great curry at Jatujakthai restaurant nearby. We were still exhausted by the time we went to bed. This Thanksgiving we had the opportunity to introduce some fine folks to the tradition. Christina of course was excited to experience the food and customs of a Bulthuis Thanksgiving. In addition, some friends of the Rubesh's from Sri Lanka, Pri and Miriam and newborn Aleda joined us for the day. Bjorn, Jenny, Ada, Ruby and foster boys Ricky and brother Aiden came up from Corvallis, and Markus and Steph came over from Seattle. They all stayed for the weekend and we watched Coco on Friday and went swimming in Bainbridge and shopping in Poulsbo, followed by a fill up at King's Wok in the evening. It was fun to have the new kitchen and new dining room functional. It worked well and we are happy with the new layout. We celebrated our fortieth anniversary this past weekend. We took Christina down to Corvallis for 'respite care' at Bjorn and Jenny's. Esther and I were able to watch Ada's and Ruby's soccer games before driving to Newport for an overnight getaway. We stayed at the Agate Beach Best Western which was OK but probably not our first choice, but late bookers cannot be choosers. The view was great and the weather Saturday evening was nice. We strolled around Nye Beach in the afternoon and after a short nap back at the motel, went out for dinner in Depot Bay at Tidal Rave. In the morning we took a walk on the beach before the rain came late morning. A huge breakfast at a Nye beach cafe gave us fuel for the whole day. We picked up Christina in Corvallis and headed home, stopping at IKEA for a mirror for Christina's room. Esther and I have the special opportunity to abandon our empty nest and be parents for a year. Christina is the daughter of Esther's cousin Kjellaug who lives in Norway. Christina will be living with us and attending high school here. We are looking forward to having Christina in our lives and home this year. Kjellaug and Christina arrived a week ago, and Kjellaug stayed for a week to help Christina get adjusted. Unfortunately, Esther had to work during the days, but we packed the evening and weekend with social engagements. Fortunately, I did not have responsibilities for the week and was able to chauffeur the ladies to shopping and getting registered for school. Christina jumped right into social life and tried out for a couple of sports, settling on swimming for the Fall. 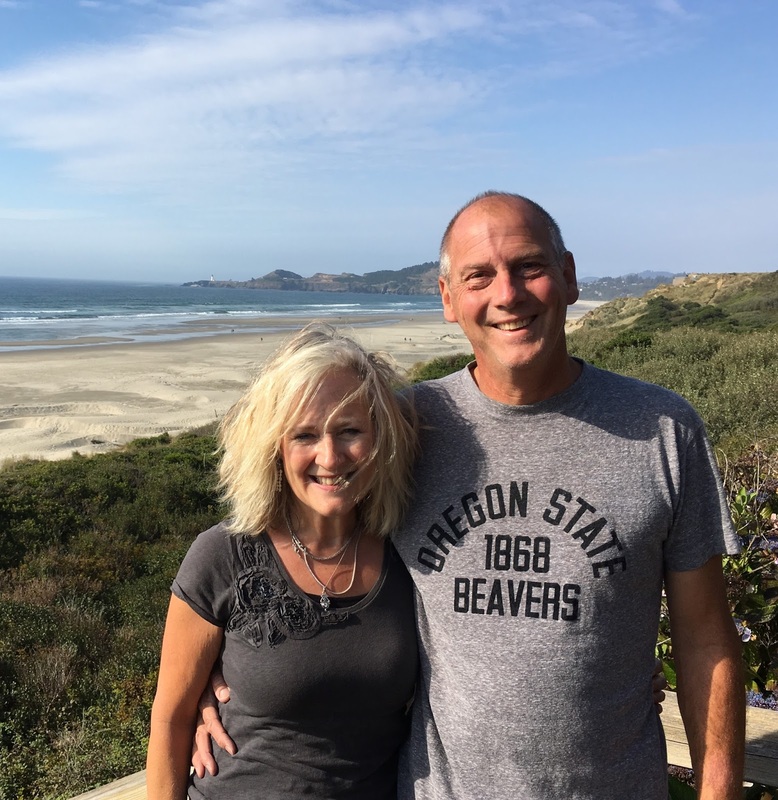 We were the recipients of hosting the honored guests and were able to spend time with the Eides in Cle Elem, Anna in Tacoma, Markus and Steph in Seattle and the George Eide family in Lake Tapps. The busy week ended with a good bye to Kjellaug. We are excited for our 'parenting' adventure to begin. 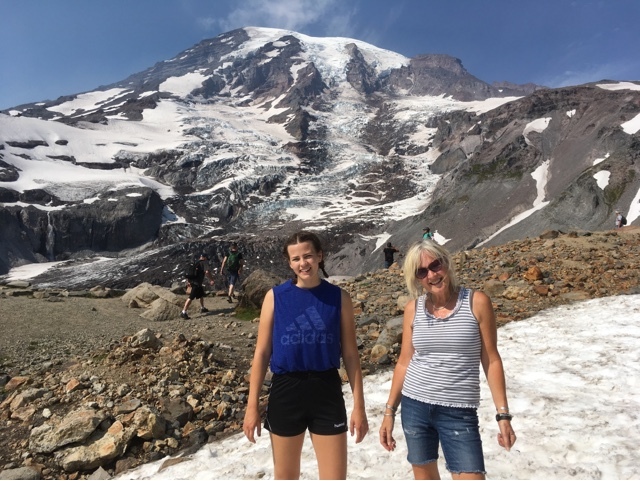 Mikal and Kay were on a mission this summer to get the Eide clan together for a camping trip. Esther and I are no longer eager campers because of too many cold/wet experiences, so we were glad the decision was made to stay on the Columbia River. Every one made it besides Kelsey and the Corvallis crowd. Four dogs kept things interesting. We had a great time with hot though sometimes windy weather. 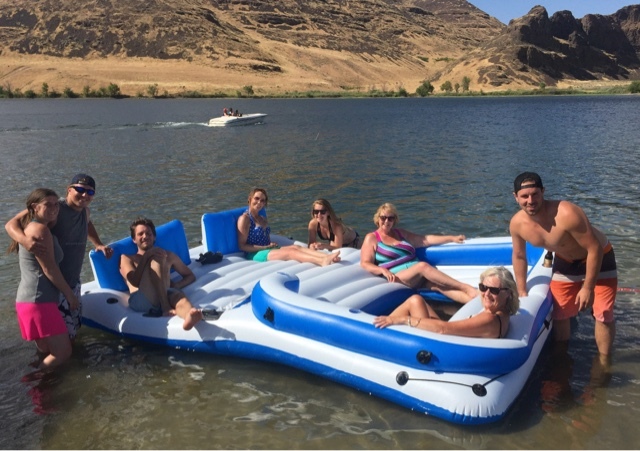 Mikal rented a ski boat which ended up being our entertainment for the weekend. We packed just about everyone in including the dogs sometimes, and took long rides up and down the river; swimming, soaking, beaching on the sandbar and even a little wake boarding. I had to swallow my sailors pride and admit that I enjoyed the motorboat. The food was great and plentiful and Esther and I enjoyed the Sienna RV while everyone else was in tents. The trip made a great ending to our summer as Esther started work and I started the summer institute on Monday.